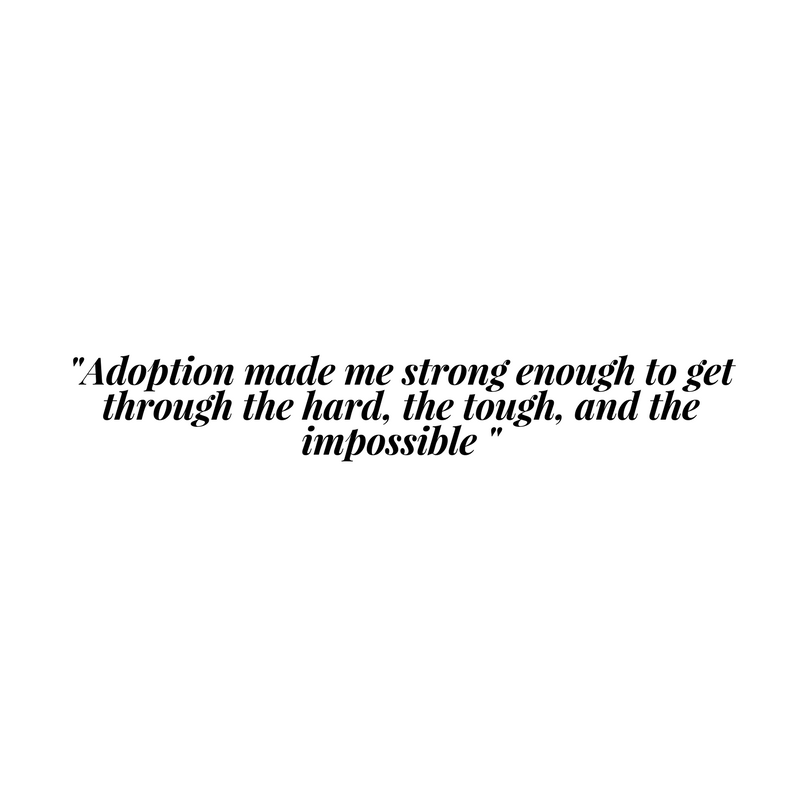 Adoption made me strong. I’ve been given up on, I’ve been walked away from, I’ve been rejected, abandoned, and mistreated; my interactions with these are deeply intertwined into my experience with adoption. Adoption made me resilient. There are a lot of ups and downs associated with adoption; adoptive family bonding, birth family questions and finding my own identity within the mess. Adoption has given me a resiliency to face life challenges head on, knowing that every time I’m knocked down, I can get back up again. Adoption made me empathetic. Throughout my experience with adoption, I have navigated through a multitude of emotions. This has helped develop a deep sense of understanding and empathy towards others’ journeys and given me the ability to listen, acknowledge and relate to so many different walks of life. because of adoption. Instead of letting that knock me down, succumbing to the victim mentality, I’ve chosen to the do opposite, using my experiences to build up my character and encourage others to do the same. something that today, I hold onto so dearly. But most of all, I wouldn’t have the drive to encourage others to become victors, believing that we can overcome anything and use our stories to help others.